There’s not much else I can add to these two well-stated calls to authentic discipleship. I’ll only emphasize the importance of personal touch in Jesus’ ministry, something that many Christians tend to avoid. We like our ease and our comfort too much. If we serve “the untouchables” at all, it’s often by proxy. God, please forgive me for my selfishness and my apathy. 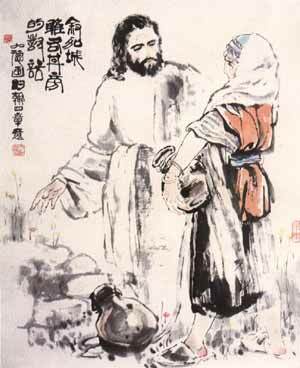 Give me the courage to be the disciple you called me to be. Help me to look outward always with compassion in my heart, healing in my hands, and gospel hope in my mouth. 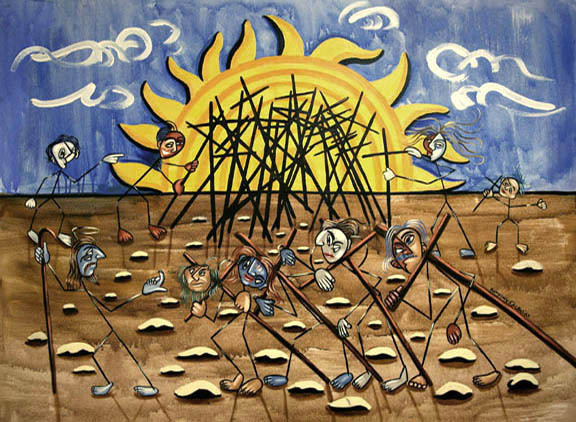 Nyoman Darsane, “Give Me a Taste of Rice,” 2004. Acrylic on canvas, 32.5 x 29 in. 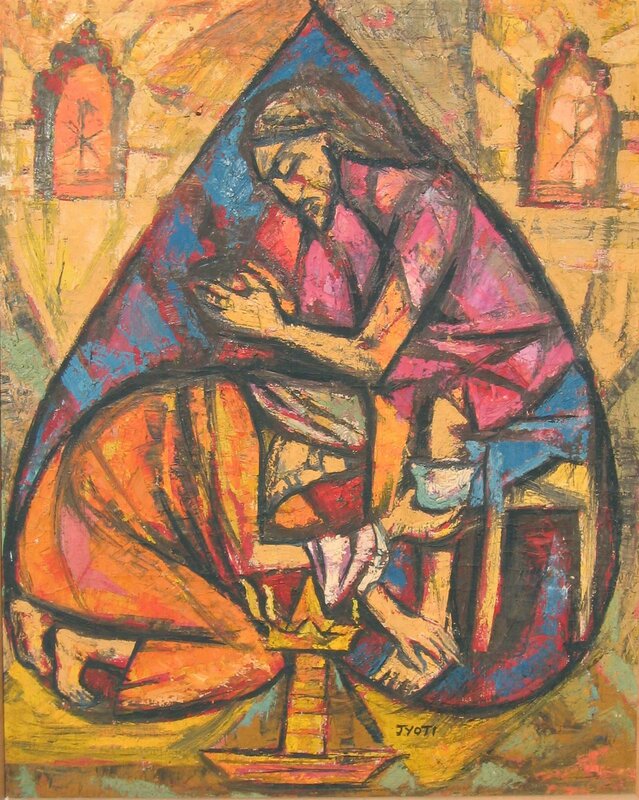 Jyoti Sahi, “Jesus washes the feet of Peter.” Oil on canvas. 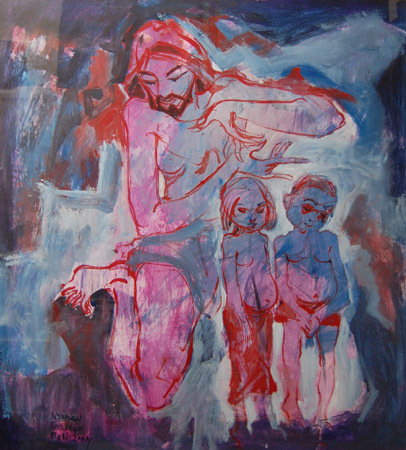 From the “Gospel of John” series. 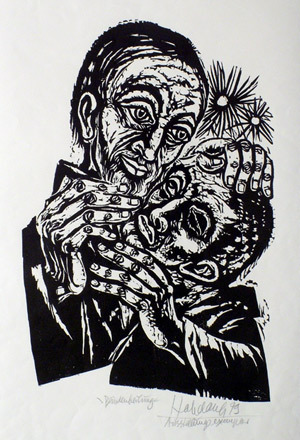 Walter Habdank, “Healing of the Blind Man” (Blindenheilung, Neufassung), 1979. “What would be the result if all the church members of this city tried to do as Jesus would do? It is not possible to say in detail what the effect would be. But it is easy to say, and it is true, that, instantly, the human problem would begin to find an adequate answer. . . .
Yu Jiade, “The Woman of Samaria,” 2001. Chinese ink and wash on handmade paper. Anthony Falbo, “Follow Me,” 2007. Oil on canvas, 38 x 49 in. This entry was posted in Books and tagged follow jesus, in his steps, take up your cross. Bookmark the permalink.